These cake bars are Estonian and are sometimes called Streusal Cake or Crumb Cake. 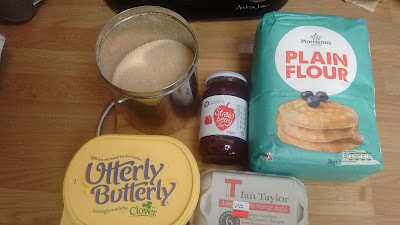 It's a nice simple recipe with only a few ingredients, I just had to buy some more jam and I was good to go! 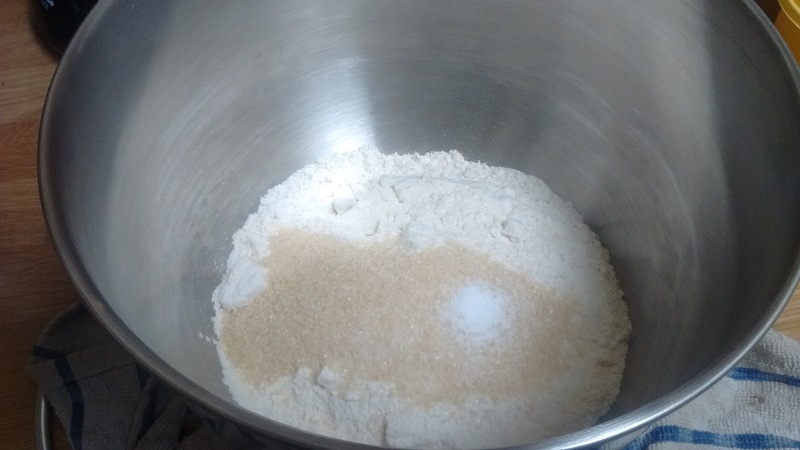 Put the flour, sugar and salt in your mixer. Cut up the butter and add it to the bowl. 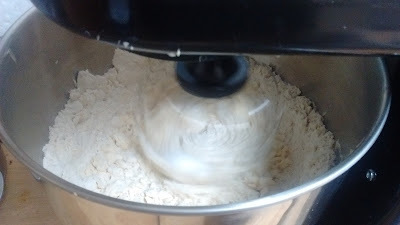 Use the whisk attachment to mix into breadcrumbs. Take out a third of the breadcrumb mix and set aside for a topping. 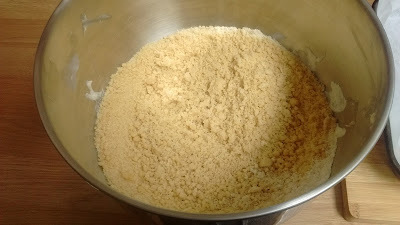 Mix the egg into the remaining crumble and it'll form into a dough. press this dough into a greased or lined baking tray. 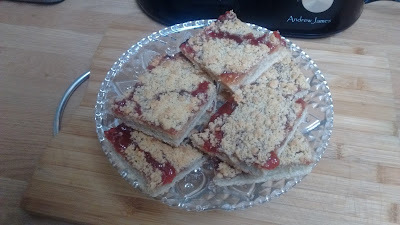 I really need to get myself a square baking tray. The one I use is rectangular and too big, the mixture never fits so I have to scooch it to one end to make it work. 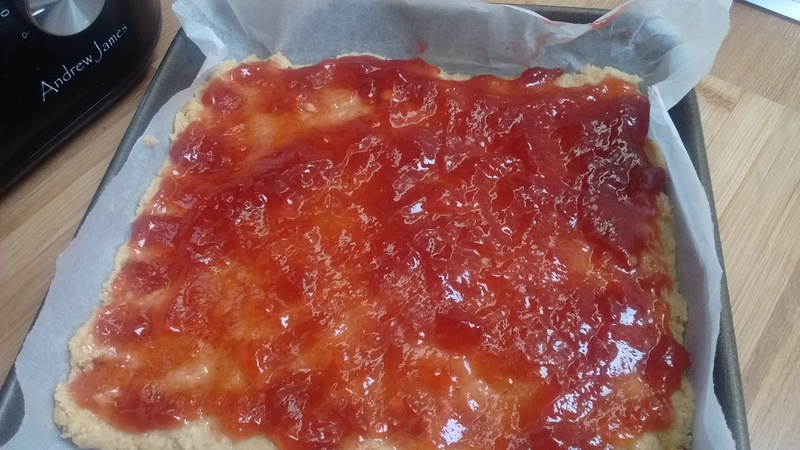 Now sprinkle that saved crumble mix on top of the jam. Cover it quite heavily because I thought I'd done enough but it sinks into the hot jam when you bake it. Bake for 30 minutes at 200C. At 28 minutes I could smell that it was just about done. I really like when recipe baking times are spot on as they're so often a bit off due to differences in oven temperatures. 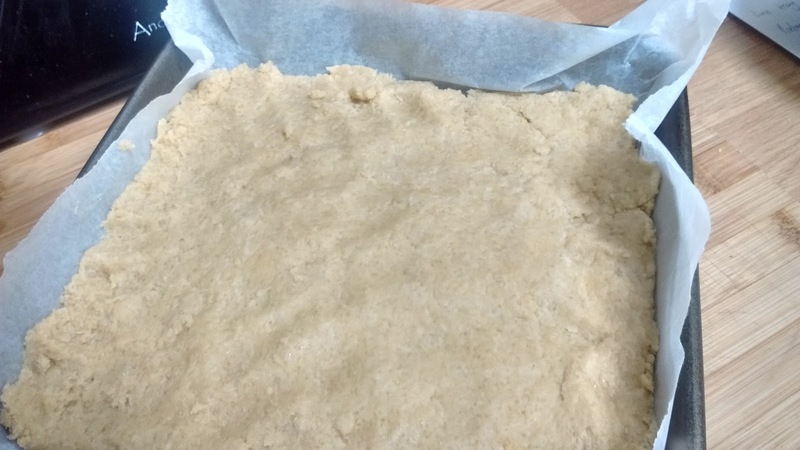 Let the cake cool for 5-10 minutes then cut into squares. Leigh and Erin were quite unimpressed with this cake offering. Erin says they make it at her school for lunches and she's had it before. (Confirmed by Leigh, as Erin often claims to have tried a food before to avoid it). So much for giving them new food experiences! Haha. 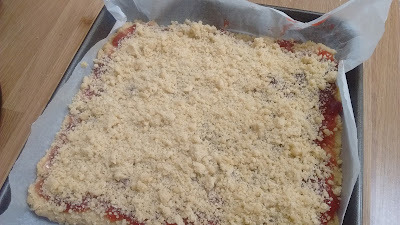 I really liked the streusal topping, it tasted a lot like eating fruit crumble and I'd like to try these cake bars warm with some custard. I liked how easy they were to make and that the base had a nice crumbly shortbread taste to it.